Create a clean, clear and healthy ecosystem, without the use of Chemicals! 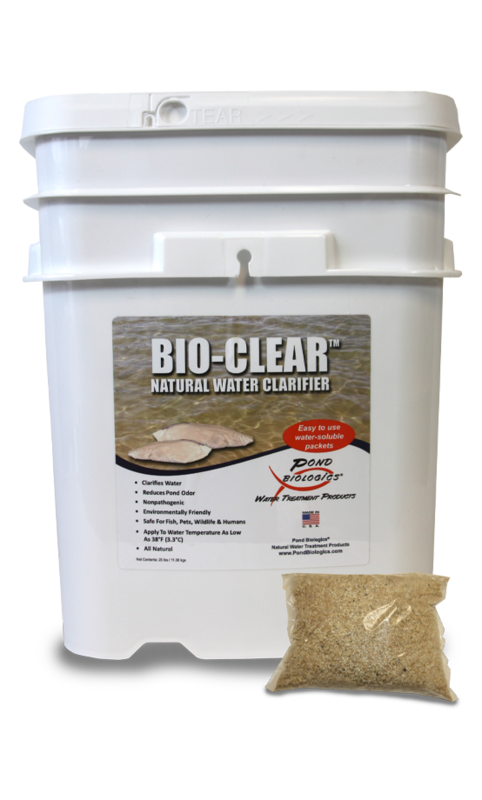 Pond Biologics®, Bio-Clear™ is a custom blend of natural bacteria and enzymes, designed specifically to reduce suspended organic debris and increase water clarity. Bio-Clear™ will also assist in the reduction of organic build up in ponds, lakes and waste water lagoons. Bio-Clear™ is environmentally friendly and has no water use restrictions. It is safe for humans, pets, fish, all wildlife and livestock. Available in 10lbs, and 25 lbs buckets. Apply Bio-Clear™ every 2-4 weeks. For aerated ponds or lakes, apply Bio-Clear™ once per month. You can apply in water temperatures as low as 38 degrees F.
Do not open individual packets. Apply Water-Soluble Packets directly to water. Bacteria will disperse throughout the water on its own.